Musculoskeletal sonography is making constant progress and its applications within the field of rheumatology have progressively expanded. Compared to other works, this book stands out for its clear explanations and quality of images. 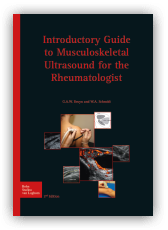 Introductory Guide to Musculoskeletal Ultrasound for the Rheumatologist is most useful for all those who will start using sonography and who wish to expand their experience.